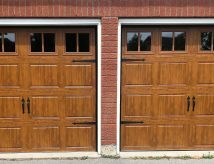 Grooved panel steel carriage house garage doors.3-layer steel grooved panel doors. 2″ or 1-3/8″ Polyurethane insulation. Insulated door R-values of 18.4 and R-12.9. Steel skins are protected through a tough, layered coating system, including a hot-dipped galvanized layer and baked-on primer and top coat. 12 factory finish paint colors available. Many glass options available including insulated options, grilles are removable for easy cleaning.